Walt Disney World, like all the parks and properties around the world, is continually in a state of flux. In fact, I’d venture to say that, with a little bit of effort, some sort of change could be documented each and every day within the parks and resorts. Sometimes these are grand occurrences, like the opening of an attraction, other times it might be as small as a coat of paint, an object being moved, new music installed on a background loop, or one type of flower being replaced with another. These changes are part of what creates the idea that Walt Disney World is vibrant and alive, and our vital to its past, present, and future success. And yet, while some of these changes are small and large, it is always fun looking back at what was. 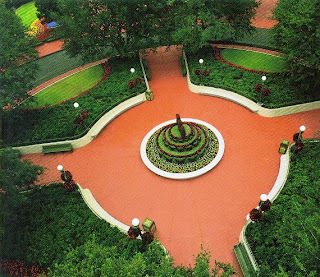 While perusing through Gardens of the Walt Disney World Resort, a 1992 pictorial of the various horticulture designs and flourishes of Walt Disney World, for an upcoming project I came across a few images that caused me to take pause and remember all the many yesterdays. Here are a select few of those images I thought you would enjoy, along with some descriptions. An aerial view of the Magic Kingdom’s Hub. 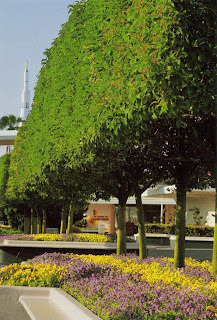 Prior to the inclusion of the Partners statue, this space was heavily shaded and often included a central topiary figure. The Imageworks landing from the Imagination Pavilion. 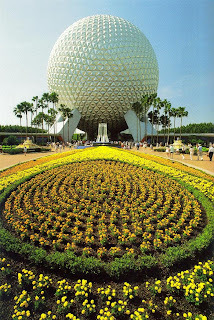 The entrance to EPCOT Center during the 15 Years of Magic celebration. The spires of the fountain are still present, along with the 15 Years of Magic’s decorations, in a very open courtyard design. The Tomorrowland concourse. From this angle, the Star Jets structure and the original sign design of The Lunching Pad can be seen. The Entrance to Tomorrowland. While the idealized dream of Tomorrowland motif that permeates the current incarnation of Tomorrowland offers stunning nighttime vistas and is impeccably designed and executed, this view of tomorrow will always be my Tomorrow that Never Will Be. it's these little things that i miss so much. 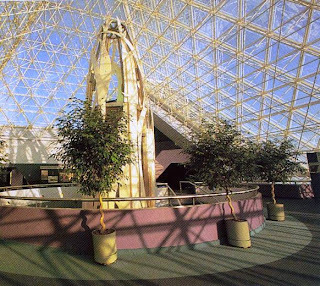 Looking at the trees of the Tomorrowland Concourse reminded me the shaped trees are no longer in front of the Contemporary :(. When they refurbished the Contemporary last year, they decided to redo all of the landscaping and unfortunately the beautiful shaped "Dixie Cup trees" fell victim to the rehab. They now just have ordinary trees lining the Contemporary drive. It is amazing that, by frequenting a place like Walt Disney World on a semi-regular basis, you can begin to forget what it was like and remember only what it is now. That's why I like these little jaunts down memory lane. Marilyn, there are some photographs in this same book of the conical "Dixie Cup" trees. Hmmm,... 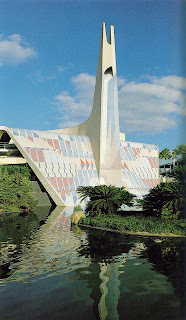 I may have to to a look back at the Contemporary some time soon. I really miss the look of the "old" hub. The shade trees were beautiful and gave the whole area a little town feel. Same goes for Town Square. With all the big tree's gone in these two areas, both Town Square and the Hub feel stark and BIG. They used to feel more intimate, like DL. Now they're just big open spaces with no charm whatsoever. Thank god that they left the tree's flanking the entrances to both Liberty Square and Adventureland. I love the pictures - thank you for sharing with us - and I don't remember the old hub at all. I only visited in 1990 for the first time - then again I think in 1992 - and was only 8/10 so I really don't remember it... So thank you even more for sharing!